Ideal for recreation, teaching or work, Story Cubes are an endless resource for inspiration and fun. They may not look like much, but don't be fooled. 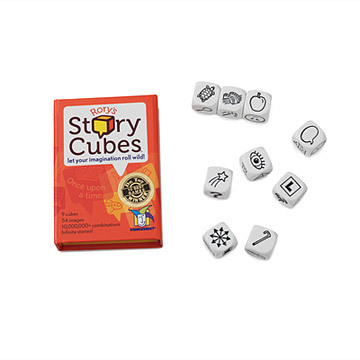 With just nine cubes, and 54 images all-together, Story Cubes bring ten million different combinations to your fingertips! Great for recreation, teaching or work, they're an endless resource for inspiration. Whip them out at parties for creative ice-breaking games, in classrooms to stimulate minds of all ages, or to help yourself finally figure out how to end that magical realism novella. Seriously, no matter where or what you'll use them for, you'll be on a roll! Made in China. Check out the gift lab of Rory's Story Cubes on our blog! Box: 4.1" L x 2.9" W; 9 Cubes: each 0.75" x 0.75" x 0.75"
Awarded the Dr. Toy's "10 Best Games award" 2008. There are several ways to use the dice, but the one my family settled into was rolling all 9 dice and coming up with a story that incorporated each of the 9 symbols into it. It was fun to theme the stories and to work on impromptu creative thinking. I want to buy a second set for my son, since this was a present for my (adult) brother! I have used these with family and friends as we make up our own rules. I also use them in training sessions in narrative medicine, empathy, conversation and communication. Literally the perfect gift for my sister, Rory. I have given this as a gift to many kids in my life and everyone loves it and uses it over and over. It can be a new story every roll of the dice! I have played this game with 5 year olds, up to 40 year olds and everyone had fun! Great to take babysitting, or play in the car. You can even buy extra cubes to spice up your stories!!! Great for keeping in my purse, for those days when your out and need to occupy the kids. The small size and box make this a game to take on the road. Love it. Exactly as described. Some of the pictures are totally undeciperable!